Cancer-causing human papillomaviruses (HPVs) diverged from their most recent common ancestors approximately half a million years ago, roughly coinciding with the timing of the split between archaic Neanderthals and modern Homo sapiens, according to a study published November 1 in the open-access journal PLOS Pathogens by Zigui Chen of the Chinese University of Hong Kong, Robert Burk of the Albert Einstein College of Medicine, and colleagues. Epidemiologic studies have demonstrated that persistent infection with HPVs is the main cause of cervix pre-cancer and cancer. But the origin and evolution of cancer-causing HPVs remain poorly understood. To better understand the molecular evolution of HPV16 and other types of HPVs that cause cancer, the researchers isolated viruses from primates, performed viral genomic analyses, and estimated the divergence times of cancer-causing HPV variants from their most recent common ancestors. The findings suggest that the first stage of the evolution of cancer-causing papillomaviruses is niche adaptation of viruses to host ecosystems, followed by coevolution of viruses with their primate hosts for at least 40 million years. 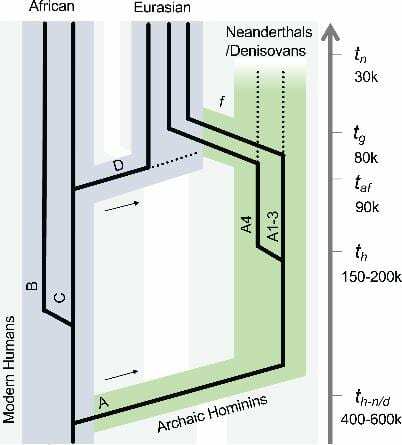 Genomic analyses revealed an estimated ancient divergence of HPV16 variants from their most recent common ancestors approximately half a million years ago, roughly coinciding with the timing of the split between archaic Neanderthals and modern Homo sapiens. The findings revealed recent viral sexual transmission from Neanderthals to modern non-African humans through multiple interbreeding events in the past 80,000 years. According to the authors, understanding the evolution of papillomaviruses should provide important biological insights and suggest mechanisms underlying HPV-induced cervical cancer. Funding: This work was supported in part by the National Cancer Institute (CA78527) (RDB), the Einstein-Rockefeller-CUNY Center for AIDS funded by the NIH (P30 AI-124414) (RDB), and the Einstein Cancer Research Center (P30CA013330) from the National Cancer Institute (RDB). RD acknowledges the Korein Foundation and the Sackler Institute for Comparative Genomics at the AMNH for their continued support. ZC was partially supported by a grant from the Research Grants Council of the Hong Kong Special Administrative Region, China (Project No. CUHK 24100716). Work at IARC was supported by a grant from the Institut National du Cancer (INCa), France (SHSESP 16-006) (GMC). The funders had no role in study design, data collection and interpretation, or the decision to submit the work for publication.